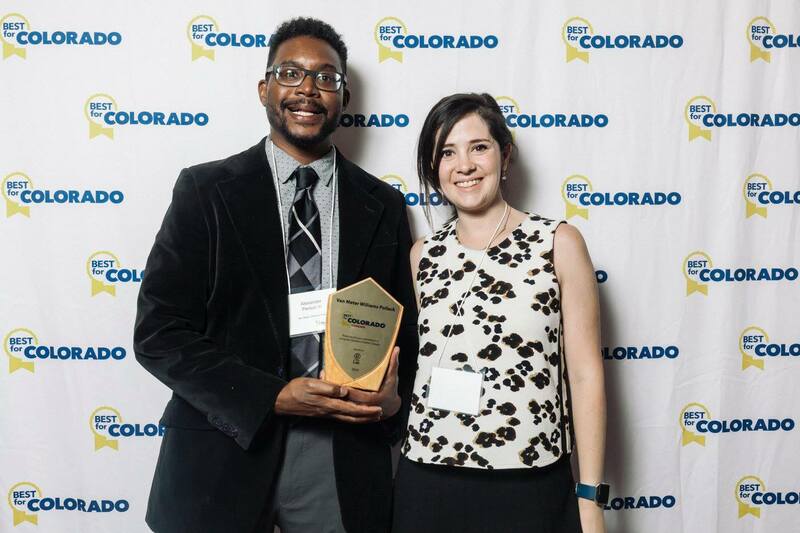 The “Best for Colorado Honoree” is an award given by the non-profit company B Lab in recognition of VMWP meeting rigorous standards of social and environmental performance, accountability, and transparency. VMWP received a score of 106.9 and was boosted into the top percentile by the work we do especially in the community & environment categories. The average score for business’s that take the “B Impact Assessment” is 51.3. Alexander and Josefina from our Denver office accepting the “Best For Colorado Honoree” award on behalf of VMWP. More than 300 companies participated in the Best for Colorado program by completing an online Challenge assessment and took a pledge to continue their journey of impact measurement, management, and improvement. Of the 300+ companies that participated in the Best for Colorado Challenge, 16 companies, including VMWP, received a “Best for Colorado Honoree” award, and 3 companies received a “Best for Colorado Honorable Mention” in recognition of their positive impacts on the environment, the community, and their workers. There is a growing community of more than 2,100 Certified B Corps from 50 countries and over 130 industries working together toward one unifying goal: to redefine success in business. As an individual company, we aspire to use the power of markets to solve social and environmental problems. Collectively, B Corps lead a growing global movement of people using business as a force for good. Through the power of their collective voice, one day all companies will compete to be the best for the world, and society will enjoy a more shared and durable prosperity for all.